New Delhi (AFP) – India launched its first electronic trading portal Thursday to allow farmers to sell their goods across the country, in move aimed at improving livelihoods of struggling growers and boosting the rural economy. The National Agriculture Market (eNAM) will allow farmers to monitor the cost of commodities, gauge demand and gain easier access to markets in other parts of the nation, which will boost competition and eliminate middlemen. 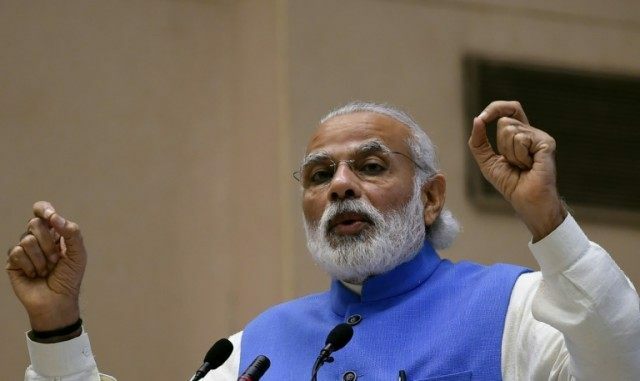 “This will empower the farmers who will now decide when, where and at what cost they want to sell their produce in any part of the country,” Prime Minister Narendra Modi said at the launch in New Delhi. He said eNAM will also “usher in transparency” and help the government meet its target of doubling farmers’ income in the next five years. In February, the government pledged to spend billions of dollars to help struggling farmers through various measures, including a crop insurance scheme and better access to markets. India’s vast farming sector is suffering after two years of weak monsoon rains, and from high inflation. The eNAM platform currently lists 23 commodities and integrates 21 agricultural markets across eight Indian states. It plans to include over 400 markets by next March, and 585 markets across India by March 2018. “For the first time in India, ‘one nation and one market’ is being developed and this market status will be elevated to the status of international market,” India’s Agriculture and Farmers Welfare minister, Radha Mohan Singh, said at the launch. While farmers can currently access markets outside their own region, many are deterred from doing so because of inter-state tariffs and conflicting regulations. The country’s agriculture sector, which employs about 60 percent of the population but contributes only around 15 percent of India’s gross domestic product, is largely dependent on monsoons. India is now the world’s fastest-growing major economy, but two years of ought and a failure to create jobs for a burgeoning young population has left millions of rural residents struggling.